Where will the South's forests be located in 2060? 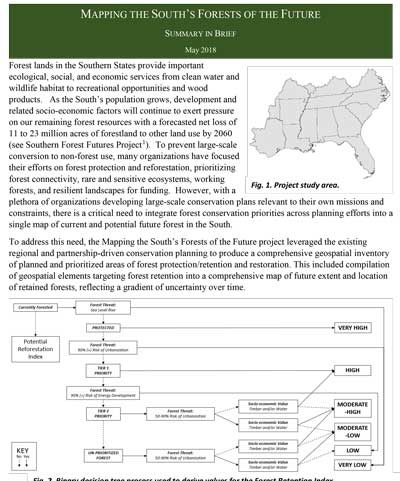 Mapping the South's Forests of the Future examines where forest protection priorities and timber markets are most likely to keep forests as forests in the future, and where population growth and development are most likely to contribute to future forest loss. The report provides forecasting data that allows those engaged in forest protection, retention, and restoration to develop prioritized geographies in which to work. Keeping Forests as Forests (KFAF) is a regional partnership created in response to the ongoing conversion and loss of forestland in the Southern United States. The partnership represents an attempt to re-frame the conversation around forest conservation from one of “protection” to one focused on the long-term economic viability and sustainability of working forests. The National Association of Conservation Districts hosted Scott Davis on their blog to highlight the purpose, need, and actions of the Keeping Forests as Forests Partnership.